Last year in the month before SBM's first reenactor'stimeline event I was looking at the lineup of military camp after military camp, and at the concentrations of groups by time period and decided the event desperately needed some women's history, especially representing the early 20th century. As a bit of a lark I put up a Facebook post asking if any of my friends would be up to portraying a few good suffragists to help drum up support for votes for women at the timeline. I got many good responses, some of whom were actually quite serious about coming out on July 2nd, especially if I could supply costuming. 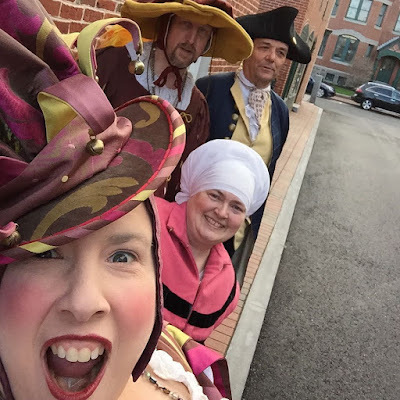 A quick conversation with the head of SBM's role players confirmed that she would be happy to help with costumes (we have a 1908 house and a 1919 one) and would like to help with the group itself. The group that came together was a fabulous mix of feminists, reenactors, and friends. Not every one was a history nerd, not everyone was comfortable portraying history in front of the public, but we all felt it was really important to respect the women who stood up for our rights by reminding museum goers of the struggle less than 100 years ago. In the few weeks before the event I convinced my dad to go through his plywood collection for some sign sized pieces, found some blank banners online, and even roped in one of the SBM summer interns to make up some votes for women ribbons we could pin to our costumes. 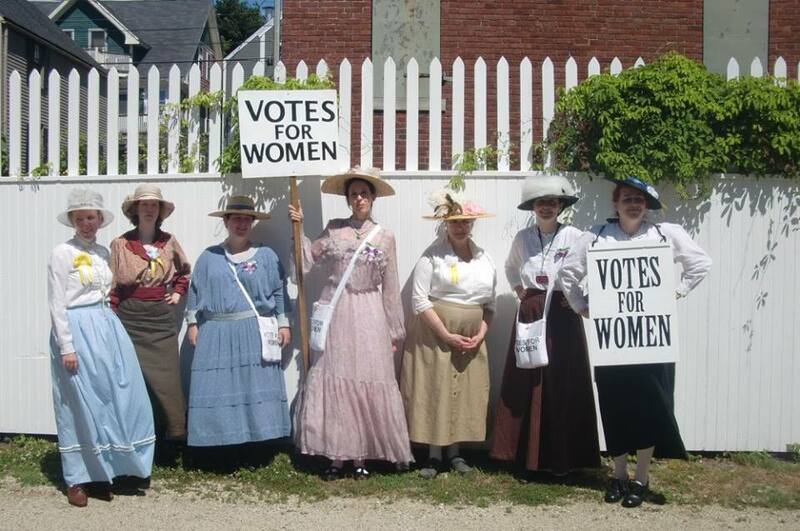 I frantically painted signs and lettered banners, just enough for a small group of women to be recognized as suffragists. I saved the orchard next to SBM's 1919 house for our set up, and in the week before the second I dug through my closet and went to the local thrift shops to assemble my own outfit. I was going for 1908 for my outfit. I already had the petticoats & walking skirt, but my early 20th century shirt is a warm flannel one, and my hat is a winter wool one, so a new shirt and hat were in order. Along with organizing a new event, and putting together the suffrage group I unexpectedly spent a week in the hospital just before July. I had no time to make anything, but I had a black straw hat, and found taffeta ribbon at Michaels. I wrapped the entire spool of fluffy white net around the crown of the hat to make it look like a massive (but light and airy) Edwardian hat. Then at a local Portsmouth store I found a white cotton nightgown with the right sort of details and collar. I didn't even bother to shorten the nightgown, just tucked it into the skirts and wore it like a shirt. I knew I would not get to spend a lot of time with the other suffragists, I'd be too busy managing the event. But I really wanted to dress up; and a nice shirtwaist, walking skirt, and straw hat were fine for this working girl. Early on the morning of the 2nd all us suffragists met in the SBM costume storage rooms. Most of the ladies had not met each other before, but they all quickly bonded while getting into new and interesting costumes, and talked modern politics as well as historical. By the time I lead them out to the orchard I knew they'd have have fun and well represent our foremothers. During the day they figured out to let people try on the "votes for women" sandwich board, visitors had a good time taking photos of their friends carrying the signs. The women talked to visitors from our modern perspective about why equal rights are still important today and about the historical fight to vote. From all the feedback I heard only good things about all the conversations they had. By the end of the day they all agreed to come back next year, and even maybe get together some other times too. We haven't done that yet, but I've got plans. I think the group will be even bigger in 2017, but I'm hoping it will be just as positive and just as much fun. I think I'll have a cool new outfit too. 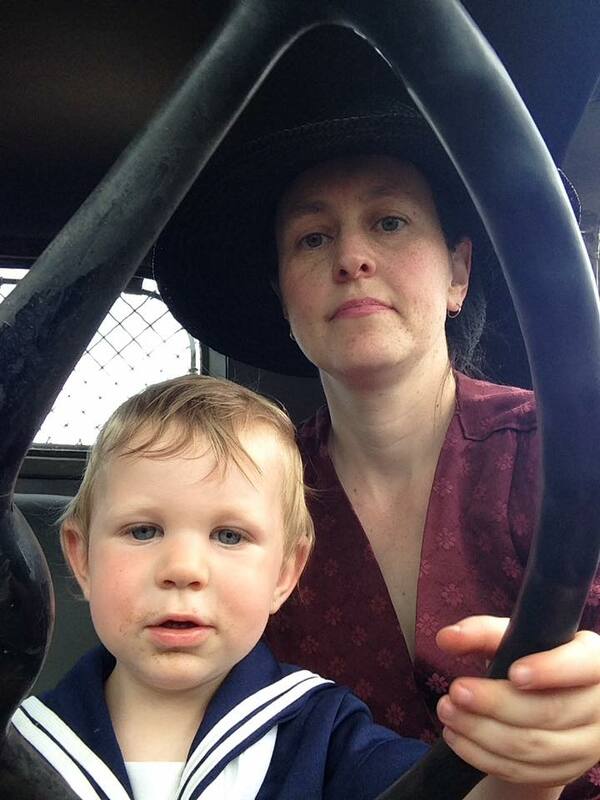 Percy drives Mama in a Model A. Probably a good idea to keep my eyes closed. Stephen and I went on a Midwinter Mischief tour at Old Sturbridge Village on February 4th. It was their first day of the special program. We went on an afternoon tour, but it was still the first day of a new program. The program was a semi-guided tour, with a meal included for $20 for non-members, which is a very decent price. From the OSV visitor center we were lead by a costumed guide who walked us across the village to the Bullard Tavern. He stopped us halfway through to recite a verse about the experience we were about to have. He was very awkward, dropping his lines and struggling with the tempo and rhyme scheme of the verses. I got the impression this was not his idea of a good time. But when we were met at the tavern by “Mr. Bullard” he was enthusiastic in his acting. He encouraged us to eat first and assured us we’d get on a tour, but we declined since we’d eaten in the car on the way down. After using the restroom, we asked where we could catch our 1:45 tour, it turned out the 1:30 tour had not left yet so we jumped in on the end of the orientation for that tour. The orientation was lead by the “town gossip” who was very good at making everyone laugh as she handed out cards to each person with the “role” we would be playing. Everyone got a nicely printed glossy card with a silhouette on one side and a paragraph about the role on the other. In the sitting room of the tavern another costumed person came in to tell us , in verse, about the peddler who spent last night at the tavern, ran up a tab he could not pay, and promised the tavern keep that he would return “with a tin cup overflowing with Gold”. The costumed person (who I’m told was supposed to be a tavern regular)told us the peddler then went to the Tinsmith shop, and we should go there to look for him. He did not follow us, but pointed the group in the right direction, we all walked ourselves (I think there were just under a dozen up is on this particular tour) over to the Tin Shop. - The Parsonage, grating chocolate with the parson’s daughter, getting a sermon on the evils of drink from the parson. - Outside visiting, with an oxen pair. All of these stops were roughly ten minutes in length, all involved some interpretation, at least one hands-on opportunity for someone in the group, plus a few verses of script about “that pesky Peddler.” Each stop felt like a pretty good length, with a good mix of learning and story. None of the walks between buildings were so long that they felt arduous, and even though most of the stops the group had to stand, there were enough sitting stops mixed in that the general visitor did not feel too worn out by the end. We almost bumped into the group before us twice, but both times they were coming out as we went in, and we never ended up waiting for them. We never ran into the group behind us. Nor did it feel like the interpreter/actors were watching the clock, or rushing us through, their timing was very good. After the last stop, our visit with the oxen, we were met by the last actor, a skinny young man in a top hat who did even more verse speaking, heading back up to the tavern. He was dressed quite differently from the other interpreter/actors, and was a better actor than most of them. Halfway through the walk back toward the tavern he produced a tin cup, giving the first inkling that this was the peddler we’d been “looking for” during our tour. For a little while at the end of the tour it felt quite clever, how the script had worked our group around to “discovering” the peddler, but by the time we got inside the tavern the clever part felt pretty empty. My takeaway as we sat eating our soup (they’d kept some warm for us when I’d refused to eat before our tour) was that the “Midwinter Mischief” was a cute gimmick to get people on to the grounds during the month of February. The OSV actor/interpreters were the museum’s regular staff, and while a few did a superb job most of them gave off a distinct air of silly. They were portraying silly town characters, reciting silly lines about a silly peddler. This tour was not something to be taken seriously. In the end, everyone knew the peddler would come out on top, the town was no worse off for his visit, and there was no effect on the lives of real people, real history. I think that did an incredible disservice to the history that they were interpreting. Every visitor was given a lot of information about life in a New England town in the early 1800s on this tour, but since the script was so gimmicky, and the actors so obviously just reciting their lines and not portraying real people, I believe it was hard for the visitors to go away with any emotional investment in what they had learned. Mystic Seaport does an incredible job using engaging emotional content in their programs, as do some of SBM’s roleplayers, so I know it can be done. Midwinter Mischief’s plot was fairly weak, and definitely came off as an excuse to visit the best houses in the village, not as an interpretation method itself. This could be because OSV hired a theatre person instead of a history person to write and direct their program, but I’ve seen amazing theatre that is emotionally engaging, so that can’t entirely be it. I think the most I can say about the program is that it is a cute gimmick to get people through the doors, and show off the best of OSV in a winter setting. The worst is that there was so much potential if they had put more emphasis on actual history, and if their staff running the program had felt more comfortable playing their parts. I’m a bit sad I did not post more in 2016, ah well. Trying to remedy that this year (sound familiar anyone?) But there are more cute toddler pictures on the way! I manage the museum's 4th of July event, so that one deserves a post all to itself, and I’m going to try to do that. In the meanwhile I can talk about my family. My husband and parents are so supportive of what I do. They come out to just about every event that I manage at the museum. It helps that Stephen and my parents like history, they like Portsmouth, and almost all of the events I do are kid friendly. In fact, Percy was only 2 weeks old when we took him to his first Strawbery Banke event: An American Celebration on the 4th of July. I’m also really lucky that my boss loves kids and Percy in particular, so as long as things are going smoothly, and I have someone else to hand Percy off to I can have Percy time and museum time at the same time! Just like last year, I went up to Maine to my second SCA event of the year: Great Northeastern War. Stephen couldn’t go, he had to travel, but we’d agreed to teach classes so at least one of us had to. Percy slept most of the way up, and like always, got into his historical clothes without much fuss. We watched a battle, walked among the vendors, looked at the arts & sciences projects on display. I taught a class on the Renaissance Baby. I prepared a brief handout about clothing, and a much more extensive one about period approximate toys. If I re-find the handout I might put it up here (this totally is a trend!) The class was attended by mostly moms with kids, though a few ladies who hope to be moms someday did come as well. I shared around a lot of goldfish, and put all Percy’s toys on the table to let the kids run around and play with them. Good news, most of the toys worked for older kids too. I got fairly annoyed when one of the moms told everyone after I was done talking about how easy wool gowns are, that she recommended modern cotton tunics! But she liked my toys hand-out. Stephen’s talk was on Landsknecht, and though he was willing to talk about the culture, he figured the SCAdians in attendance would mostly want to talk about the clothes. He was right. He sent me up with a basket full of books and his clothing, which I spread out, and then asked folks what they hoped to get out of the talk. Only one male was there for more than the clothes, all of the females were there for their boyfriend’s clothes. I let them go through Stephen’s outfit, and made sure that they all knew that they would never get a proper fit out of cotton, that really the outfits had to be wool, and gave a bunch of the tips and tricks we have used over the years. There were almost no questions that I could not answer, which made me feel pretty good, though I do with Stephen had been there. When leaving one of the guys said he was hoping to get an SCA Landsknecht group going. He did not have a business card and with an increasingly tired Percy I was having trouble keeping names straight, but I gave him my business card and told him to let me know, because we always like to engage with people as Landsknecht. I never head back. My favorite event of the last few years has become Gatsby on the Isles. Getting Percy in a little sailor outfit, and Stephen in a summer suit, me in fancy hat and shoes and getting on a boat! What could be better? This year we took not just one friend with us, we took two friends and my parents! My folks don’t really do the dress up thing, but my mom has nice linen dresses with no waist to them, and my dad has linen suits. They both enjoy the Isles of Shoals, picnics, and will do just about anything to spend time with their kids and grandkid. We all met on the docks, and watched the dapper gents and fancy ladies line up to get on the boat. Such amazing outfits! Such gorgeous luggage! When everyone is wearing hats, it really does feel more like a proper outing. We had more of an idea what to expect this year, so we brought our big basket cooler, some bathing things, and blankets for the picnic. I also brought a bunch of Percy’s toys. This year he was old enough to figure out we were on a boat, and to enjoy the sensation of a new mode of transportation. He loved having his grandparents there, and being able to play in the sun and the water. He is always our ice breaker, we made new friends because he is so darn cute people like to take his picture, ask us questions, and generally enter into conversations in ways they might not normally. On the island we tucked ourselves into the shadow of the big hotel, and dug in to all the food we’d brought with us. I think only half of what we brought got eaten, and we pretty much ate all afternoon. We listened to the music, strolled through the hotel and on the porch, played with Percy on the playground. We definitely played it cool, and did not exert ourselves all that much. I had brought Percy’s swim trunks, and made myself a kid-of 20s bathing suit, so we brought his watering can and wooden boat down to the water to splash for a bit. Percy’s grandpa took him around to the other side of the island to the other beach too. And before we knew it, it was time to pack up and go. In 2017 I hope to bring more people, and maybe even stay overnight at the hotel. 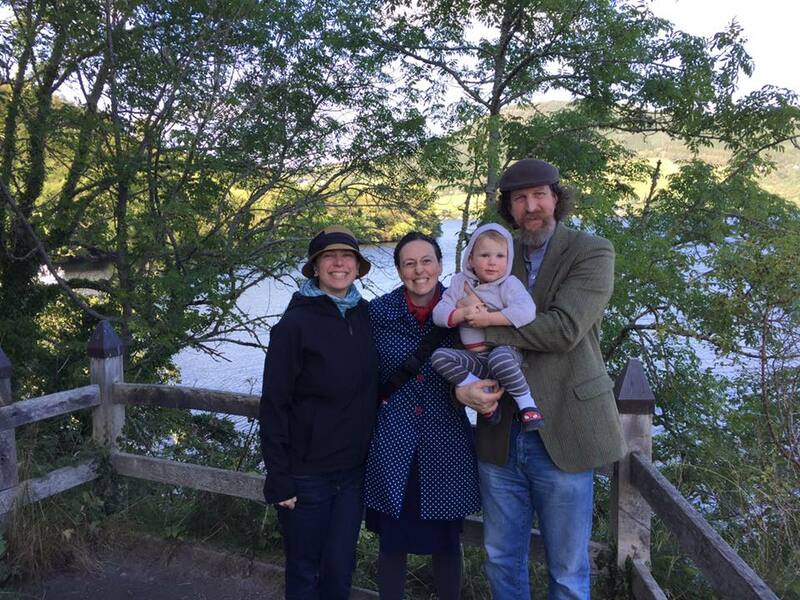 Just after my busiest event of the year, just before the CT Renfaire, Stephen and I went a little crazy and took a vacation to Scotland! Of course we brought along Percy, even if he’d just started potty training not two weeks before! Now I won’t go into tons of details of our vacation, but we saw a ton of castles, some ancient mounds, and event got to see a small reenactment. My favorite part was definitely the island of Islay (pronounced I-la.) where the villages looked exactly like they were supposed to, and we got to visit an artist’s colony with huge community type garden, and a still operating woolen mill. Yes, I bought fabric. I can’t wait to make something (hopefully two things) out of it. Plus we got tons of cute Percy pictures. CT Faire is still our biggest LH event of the year. We’re out there for 5 weekends: living in camp, making food, caring for the kids, holding demonstrations, interacting with our whole group, and being as close as we can (in the middle of a renaissance faire) to the 16th Century. I missed the first weekend and the first day of the second weekend, then all of the final weekend because of work stuff. It is a good thing I love my work, because I sorely missed being there. This year Percy was clingy, but did not try to kill himself with every camp implement. I could do very little without him being attached to me, but he was fine playing with his historical toys as long as I was playing with him, or very close by. The best day for me was the day that there were 4 kids in camp. Four kids! We had Percy, and a boy 4 months younger, then we had a four year old and an eight year old. Percy and the 4 year old have been playing together since before Percy could even play. He wears all her historical hand-me-downs. When they get together it is just like cousins, they seem able to pick up where they left off. Since Lilly kept Percy amused, I could sit nearby and do my own thing, instead of having to constantly interact with him, and with Percy to play with that kept Lilly out of the way of all the other women who were working hard. I wish I could say I was a help with all of the kids, but the youngest is fast and motivated, he was a full time job all on his own. After Faire was over I had to throw myself right back into work, so didn’t get to go out in costume again. But I felt pretty good about all the living history that did happen over 2016. And we got so many cute pictures out of it! Another year has gone by. Another one full of dressing up, learning, and having fun in history. 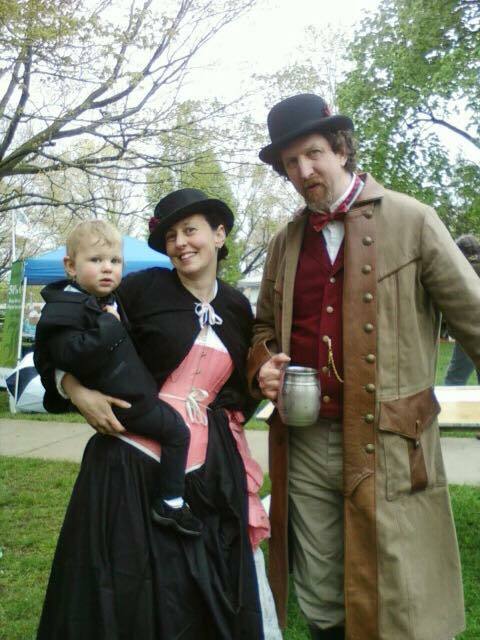 What I learned this year is that there is a history themed event going on within 3 hours of my house every single weekend, though only a few of them are kid-friendly. Also, that I have very high expectations of what a history-themed event should include. Here is the highlight post. Our very local-est of events is a winter time marketplace SCA event in Manchester, NH. In 2015 I could not go because of a snowstorm, and I missed it this year (2017) due to stomach bug, but we did get to go last year! It is mostly a chance to see a lot of old friends in the middle of the winter, since the items for sale are varied and either not in our period (16th Century) or not historical enough for us. But the chance to get out of the house, dress up, and hang out with friends in the winter is always appreciated. This past year there were only two of us who went out to Fort Wayne, Indiana. I actually left Percy and Stephen at home! There was too much drinking and not enough history for everyone else to come out, but since I stayed in the kitchen most of the weekend, I had plenty of history and very little drinking. I actually had more interesting history experiences on the way out and the way back than actually at the event itself. My companion this year was incredibly agreeable, so on the way out we stopped in Seneca Falls at the Women’s Rights National Historical Park, which is run by the National Park Service. The building where the first national women’s suffrage convention took place is still standing, but not in the same form as it was in 1840 (its last function was an auto repair garage) but still, you can go inside and sit in the space. The museum next door was quite good, geared towards both those that already had a background in American Women’s Suffrage, and those who are new to the history. As a pilgrimage site, I’m very glad that we went. On Sunday we left the event early, because one of the most well known Living History museums (at least among academic circles) is in Indiana, and since I was pretty sure this was my last year going out to this event this was my last chance to go see it. Yes, it was several hours out of our way, but when you’re on a road trip… We went to Conner Prairie. What a big site! There was no Greeter or introduction video, we just got our map with our tickets and fumbled our way through for the next few hours. We went to three distinct areas: the 1830s village, the Civil War village, and the original house. The 1836 Prairietown is the part that I had read about in school, and heard about at conferences. It is a “village” of moved-in houses where everyone is first person, and representing early life on the prairie. I was hoping for meaningful conversations, but we did not get a single person off their well rehearsed script and onto more in-depth topics. Nobody felt real, they all felt like they were acting. I know it can be better than that. The Civil War village was interesting because it incorporated video and audio, the whole area was telling one unified story of a confederate raid. There was a script, and an order to which you should tour the buildings, and it was mostly well rehearsed. The volunteers at the end of the tour were annoying, but I thought the rest was very well done, as long as you were content with the info they were giving you. The Conner Homestead also felt newly reinterpreted, not just a static display in the historic house, but really informative panels and hands-on activities in every room. I am very glad we stopped, because it was a lovely day and I can say I’ve been there. I had high expectations, really probably too high, but I did have a nice time anyways. Steampunk isn't real history. Also, we're totally late to the party. But anything that is history inspired where I get to wear my historical clothes, and possibly make contacts for work is worth the outing. I raided my 1870s clothing bin and wore my pink silk corset, and matching pink ruffled petticoat totally exposed beneath my black wool maid's outfit. Stephen pulled out his wild west stuff along with a lovely coat made by friends of ours: Chrononaut Merchantile. A few weeks before I was perusing our local kid's used clothing store and found a little tuxedo! I'm sure it was originally worn to a wedding, and probably only worn once. Steampunk is fluid in time, and Percy is cute in just about anything, so he wore a tux. We arrived just at the beginning of a dreary sort of day, took a turn through the vendors and decided the only thing we had any interest in was the food (which is generally the case at renfaires too.) The music was actually quite good, and the people watching was fun. I reconnected with the NH Wheelmen who used to come to a lot of the Museum events, and we chatted for a long time with a reenactment group that was portraying Zouaves because they also do earlier times: pike and shot like we do, and many of their members have interest in armor just like Stephen. We ran out of time to do any of the local museums, or indoor activities so I guess we'll have to go back again. The spring of 2016 was about Percy and I going on historical adventures, just the two of us. 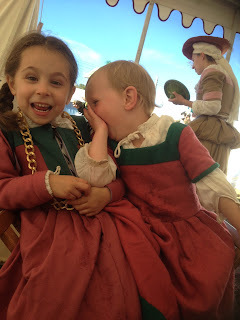 Our first such foray was to the NH Renaissance faire, just two towns over from where we live. I forget why Stephen could not come, He was traveling, or sick or something, so Percy and I set off on our own. No big deal, we have so many friends at the NH Faire that if we had needed assistance we could have asked for it. As it was we did just fine walking around, talking with friends, eating faire food, listening to music. I passed out business cards to musicians who I thought would be good additions to Candlelight Stroll, basically anyone who performed historical music and did not mind being outside in all weather. It was hot so I stripped Percy down to his historical underwear and he charmed everyone by playing with his historical toys. As a small renfaire it was more about dressing up and hanging with friends than anything historical, which puts it on the “maybe” list instead of the “definitely go again” for 2017. My co-worker says this is our Grapes of Wrath look. I am interested in all sorts of living history. If it is an event where I get to dress up and will see history in action, I want to be a part of it. So Percy and I drove out to far central, almost Western Mass. to the Massachusetts WWII weekend . There were a lot of tanks. A lot. Percy has fairly sensitive hearing, so the shooting and the flame throwers were not his cup of tea. But he thought the (Modern) helicopter was a ton of fun. We walked around the different reenactment groups, and sat in some of the jeeps. The groups that had the most interesting set up, from a non-participant perspective were definitely the German camps. They had good signage, talked about food and shelter, did quite a bit of interacting with the public. The other groups mostly talked amongst themselves, they let you look at their equipment but did not bother trying to engage; even with folks in costume, even after remarking on how adorable Percy was in his sailor suit. I got a few business cards out of the trip, but most of the groups that seemed at all interested in an event at a museum in New Hampshire were the folks in their 50s and up who would not mind bringing out their cars. I’ve got an antique car group already. Before I left I asked about an APO dance in the evening, and if they might be interested in that next year. I guess they had done one the year before and found the interest to be mediocre in holding another. I did get a very nice photo of Percy and I inside one of the jeeps, and I got a better idea of what WWII events are expected (by their participants) to be. Like 2015 we planned a weekend to spend in the woods behind our house totally in character with no modern intrusions. We came up with a different scenario for 2016: visiting a small shrine after a victorious battle. Saturday was hot, and many of our guild members exhausted themselves building shelves into our trailer to better keep track of all the guild stuff, so we ended up staying inside in the air conditioning on Saturday night and just watching Tudor Monastery Farm, which counts as historical. Instead we went out on Sunday morning, did a bit of exploring, visited our makeshift shrine, and had a celebratory meal. It was not nearly as cool as the year before, but we also did not kill ourselves, and that is a good thing. I feel like we were in custume way more than that, but last spring seems long ago now. I’m sure that we had guild workshops, and outings with friends where we did not dress up which only sort-of count. And I guess for the early reenactment season, with toddler in tow, that is really good enough. Summer and fall are coming in the next post! I did something a little different earlier this month, I was the sole organizer of a professional conference. There are professional organizations and conferences for just about everything! And that is true of Living History too. 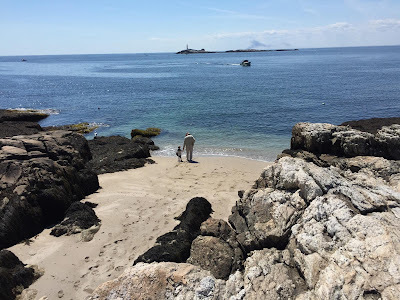 Stephen and I have attended three FPIPN Conferences, two of which I blogged about: Here and Here, and at the end of the last one the organizer asked if there was anyone who would be willing to host the next in two years. At the time I was pregnant, less than 6 months into my new job at the museum, and reluctant to take on any new projects, but even then I knew that I could do it, and that I probably would. Fast forward two years, and here we are, just a few weeks after the 2016 First Person Interpreter’s Retreat of which I was the organizer, communicator, decision maker and host. To say that I will be processing this for a while is an understatement, but I also want to get down some of my thoughts while they are still fresh. The FPIPN Retreat is usually a two-day retreat, where members of our community help each other out, teach a few of our favorite tricks, commiserate about our tough experiences, and get re-inspired for the upcoming season. My friends and acquaintances, the FPIPN Facebook group, and the parent org’s newsletter shared the call for sessions, and I heard back from people I had never met as well as some of the usual suspects. I only asked pointedly a few people, and amazingly all of those that I tapped were happy to oblige. We got enough session proposals to fill up both Saturday and Sunday, and on an amazing variety of topics: working with kids, visitors, museum management, emotional topics, new programs, unknown historical figures, an abundance of resources, in all sorts of environments. We had a total of 19 different “sessions” or chances to learn about some aspect of first person interpretation. I changed it up a little by starting on Friday afternoon with some in-character presentations, and a pizza party/Book Group. I am obsessed with finding all the books on Living History, which is still a relatively small number, and with sharing all these great books, so it was fun to pack up my LH library (one shelf in on the bigger history bookcase) into a tub (they all fit in one plastic tub!) and spread them out for conference goers to look through. I also hired a keynote speaker. There was one at the first conference I attended in 2010 which had been very inspiring, and set the tone of the conference for me. I wanted to do the same this year, and I knew the tone that I wanted to set. I see these retreats as a chance to connect to other roleplayers, and I see my job as a roleplayer to connect my audience to history. I had met a woman out in Chicago who wrote a whole book about doing just that, and I’d seen her interact, she is good, and definitely articulate. I took a big risk, and invited a Renaissance Faire performer to share with all these serious museum folks the power of positive interactions. It turned out great! I heard plenty of good feedback about how A-E was putting into words things that some folks had been thinking about for years and been unable to articulate. Or even if they’d never thought about it, now they would! She added to the weekend’s feeling of comradery and positive learning. Even before Friday night was over I heard from a Strawbery Banke colleague who came up to me and remarked that before that day she had not really thought of herself as belonging to a community, but this conference, in just the first few hours had shown her that there is a community of costumed history folks, and she is a part of it. The reenactors who attended told me they found it interesting, the museum people said they learned quite a bit. Event Stephen said he has new ideas for the upcoming year, some of which came up in the presentation that he lead, that he’d never thought about before! And many people remarked on how they had made quite a few new friends this weekend. I’m not sure it gets much better than that. The crowd for our keynote. Out and about in Portsmouth. Having way too much fun. Photo by A_E Shapera. For some, history is a bore, for others an amusing pastime. For me it is a lifestyle. $1 Million Anonymous Challenge Grant for Infrastructure — We Need Your Help!